Pyrope from the Dora Maira Massif, Western Alps, contains a trace hydroxide component (0.003 to 0.002 wt. %). Its infrared absorption spectrum, consisting of four sharp bands in the 3,600-3,660 cm-1 region, is different from that of all other reported pyrope and pyrope-almandine garnet spectra, and does not correspond to the known hydrous inclusions in the pyrope. 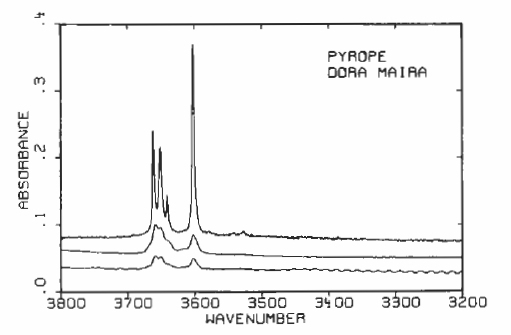 Infrared spectrum of a series of 0.5 mm thick slices of pyrope from the Doria Maria Massif.